Thanks to this, in some ways Camiguin feels like a world unto itself. It may be part of the Philippines, but like so much of the rest of the country, all it takes is a few kilometers of water to create a microcosm of life that is both Filipino and something more at the same time. 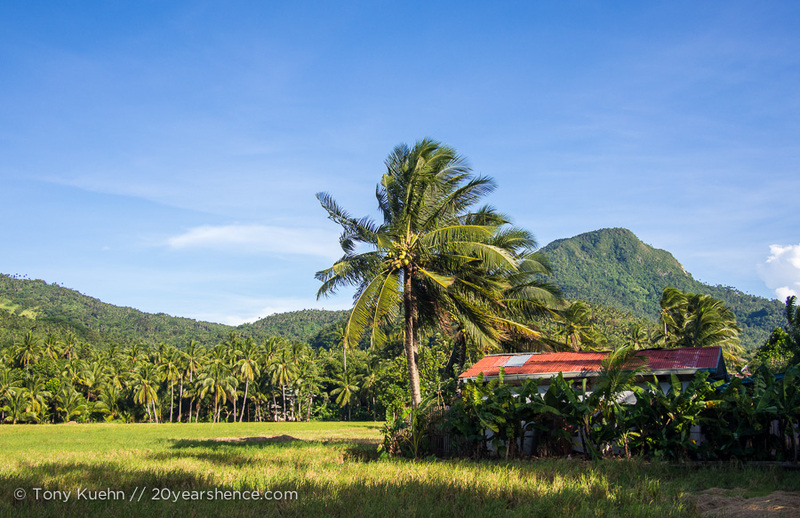 Every island in the Philippines has a slightly different flavor of life, and Camiguin is no exception. The friendliness, the love of music and singing, the smiles and easy pace of life one gets so used to in the Philippines are all here, but so is something else. There is a feeling of freedom and detachment from the rest of the world that is hard to explain. Perhaps the people of the island are part of the difference. They go beyond friendly. In fact, an adjective other than “friendly” is needed to describe the people of Camiguin (and the Philippines in general), but it’s hard to think of anything more apropos. Their default mentality is kindness, from riding out of their way at night to help travelers whose motorbike has run out of gas, to a simple smile, idle conversation, and a genuine interest in the strangers they meet. That’s not to say that the island itself doesn’t have its own wonders; in fact there is almost too much to see in one visit. Brief periods of intense geothermal upheaval changed the face of the island dramatically, and continue to form a part of the daily rhythm for locals and visitors alike. 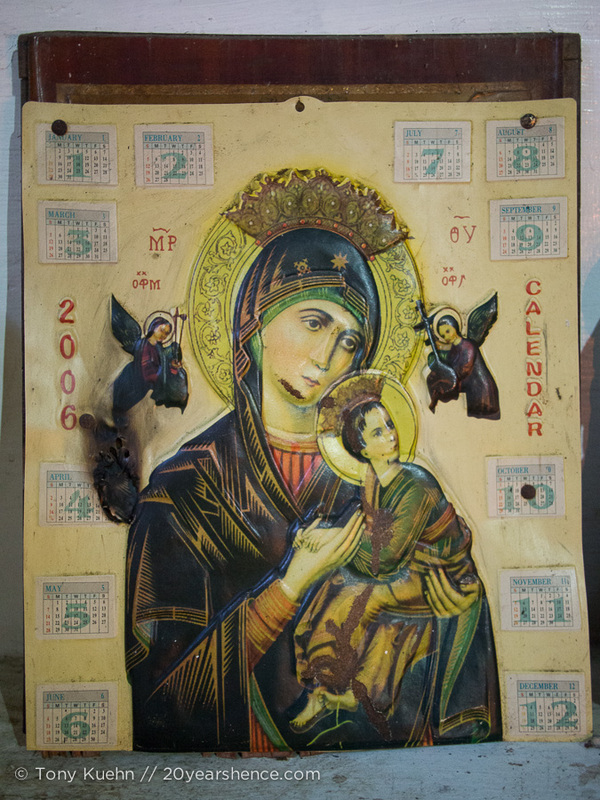 In fact, much of what there is to see on the island is thanks to volcanic activity. 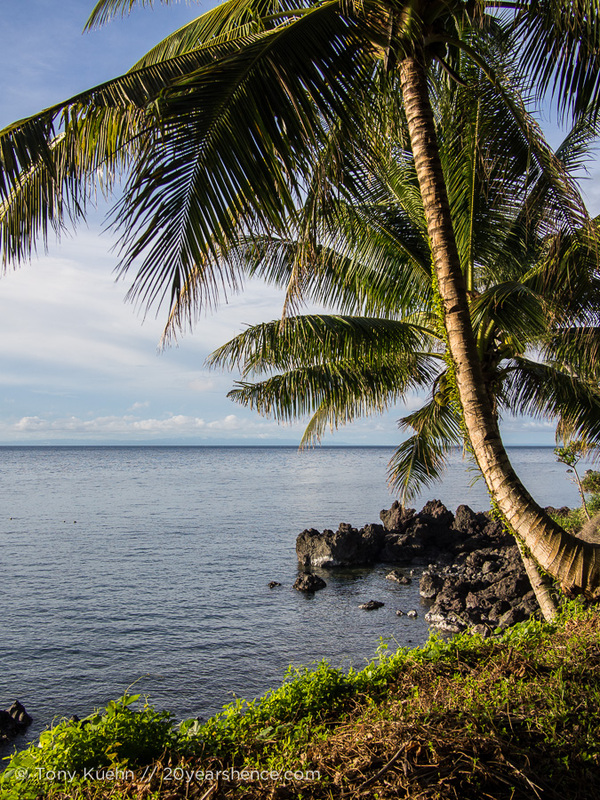 Along with its quartet of volcanoes, waterfalls, natural springs and ruins litter the island. 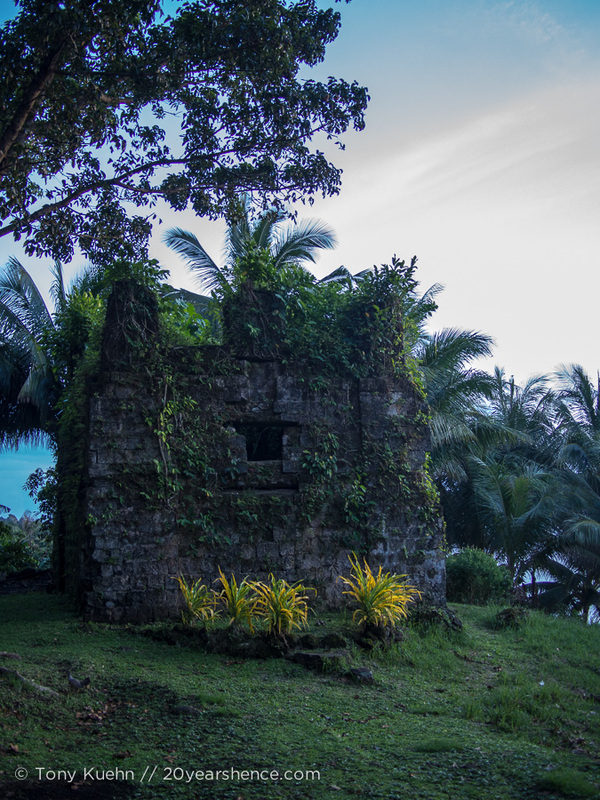 Many moons ago, the old Spanish city of Catarman sat on a picturesque cliff above the sea on the west side of the island. 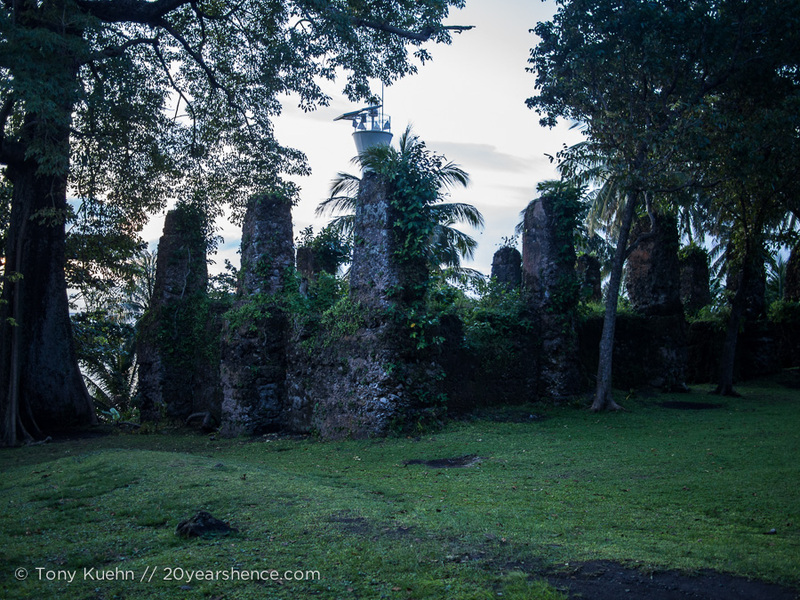 Now all that remains are the ruins of the church, along with its bell tower and convent. The rest of the city was lost in the sudden formation of Mt. Vulcan in 1871. 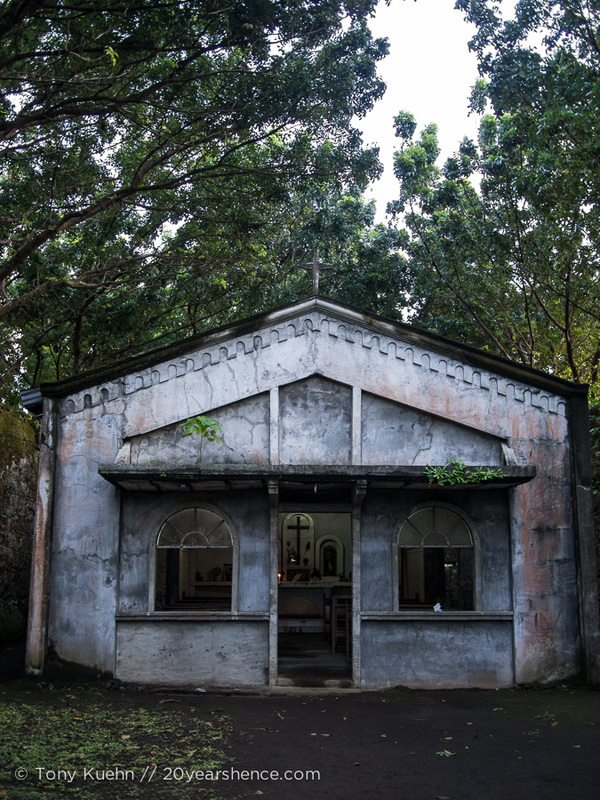 Tall trees shade most of the crumbling stone, and a newly built church huddles inside the skeleton of the old cathedral. Walking through the site, one can feel the tug of things lost to time so common in places of beauty that have been ravaged by nature or man’s hand. 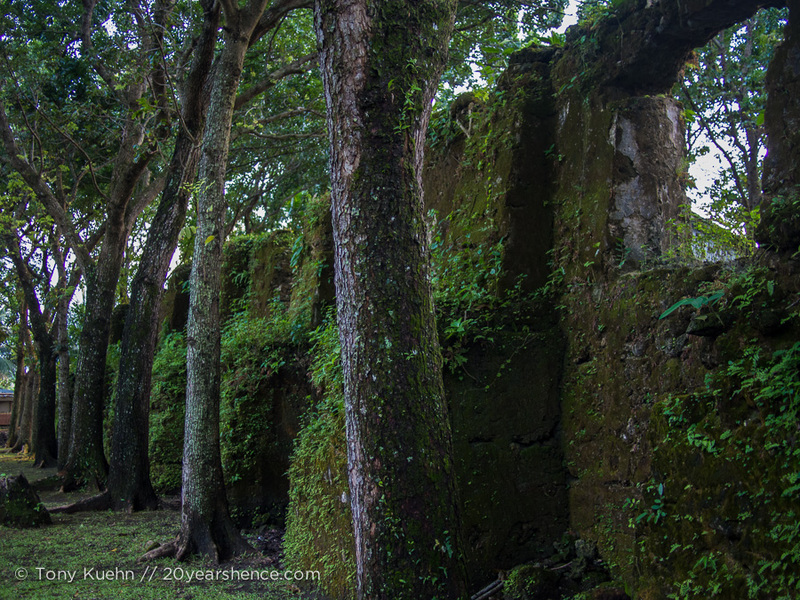 If the volcano had emerged somewhere else, or not at all, Camiguin’s old city would have been one of the Philippines’ many jewels, but instead, all that remains are mossy stones that let you dream of things that once were. The birth of Mt. Vulcan also sank parts of the town of Bonbon, including the cemetery. 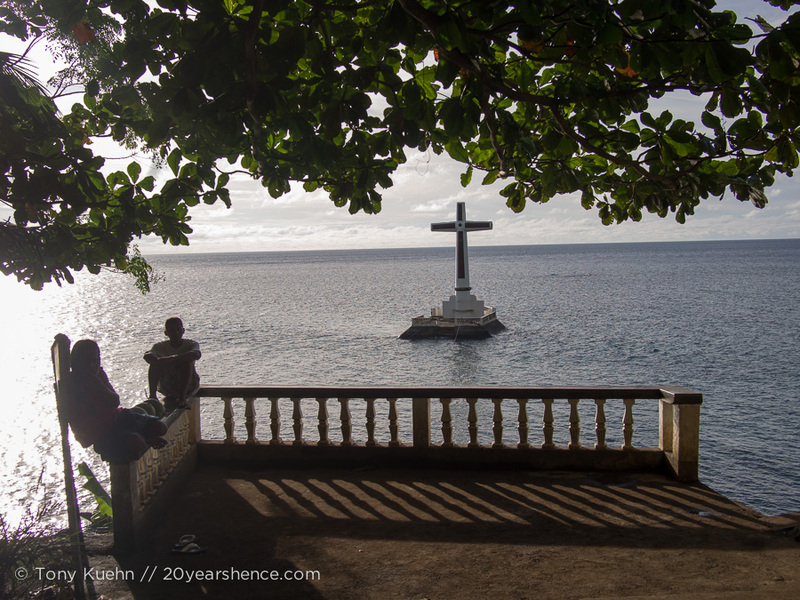 Now known, unsurprisingly, as the “sunken cemetery”, the only marker for the site is a dazzling white cross erected out in the ocean to commemorate the location of the graves. Though the name is eerie, it’s now home to good snorkeling and some nice diving, with vibrant fish life and a lot of corals. 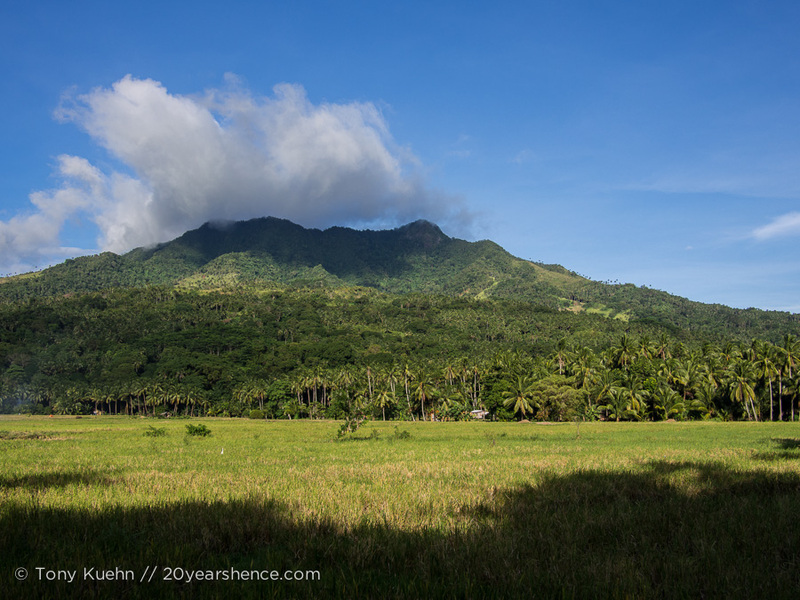 Beyond reshaping the landscape of the island, Camiguin’s volcanoes also manifest themselves in more subtle ways. 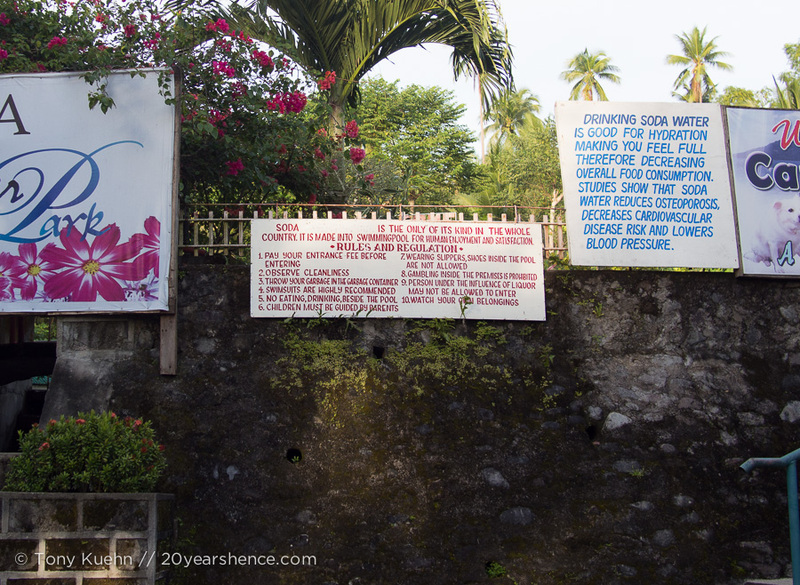 Thanks to geothermal activity, Camiguin is home to a number of hot springs, cold springs and one soda spring. The first two are self-explanatory, but the third merits some investigation: thanks to the island’s abundant volcanic activity, the water running in this spring is now carbonated! Unfortunately, the spring has been reduced to a concrete swimming pool surrounded by a playground. Visions of soda water bubbling out of a crater in a remote jungle, sadly, must be replaced with shrieking children belly-flopping into a shallow pool behind a fence. Take a moment to read these rules. My favorite is number four… as opposed to what? Do I want to know? After exploring the island’s interior, visitors always return to simply driving the ring-road. It is the be-all and end-all of the island—nothing is possible or reachable without it. Everywhere along the road children shout “Hello!” as you ride by and their parents give you a curious glance when you wave. People sit outside their homes or businesses, chatting idly, waiting for the next friend or stranger to ride up. At dusk, fires fed by coconut husks are lit to drive away the mosquitos and the air fills with a haze of sweet-smelling smoke. As the sun sets behind the volcanoes, the lights come on and dance music and the ubiquitous karaoke fill the quiet of the night. Every other restaurant is also a dance hall, even if no one is there to do the dancing. The Filipino love of music means that, though the audience may be one lonely stray dog, there will be dance music, if for nothing more than the hope that someone who wants to dance may come along at some point and seize the opportunity. 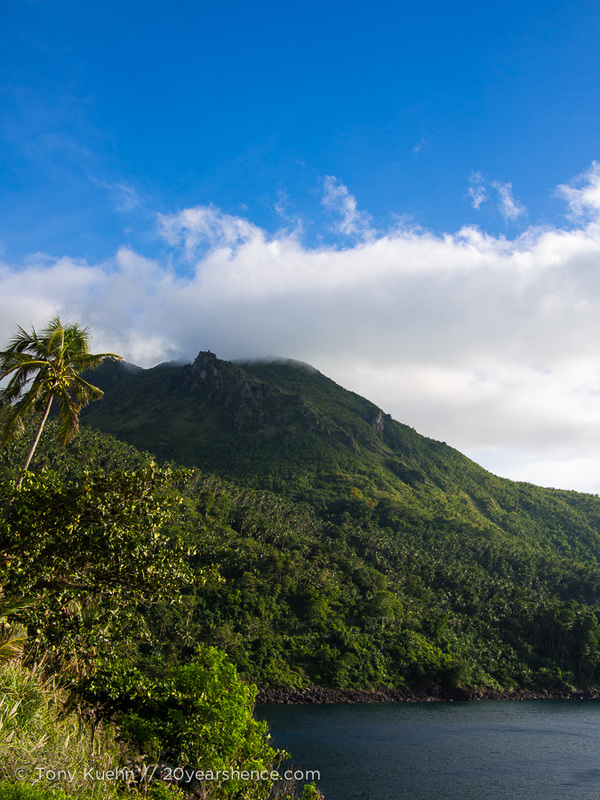 Ultimately, Camiguin’s people and its natural wonders come together to make something special. In some ways the island is something people don’t know they’re looking for until they find it. It has a reputation for being quiet and relaxing, but it’s reductive to say that’s the whole story. It’s a place to go and be free and feel welcome, but it’s also a place to really get away from the rest of the world for a little while. Camiguin may not be for everyone; it’s not exactly easy to get to and will challenge those looking for vibrant nightlife. But, for those of us who want to breathe a little easier for a while and fill our time with natural beauty and friendly people, Camiguin is about as perfect as it gets. Beautiful! One day we will make it back to the Philippines and make it to all the wonderful places you’ve visited. I hope you do, we had such a great time! We are already talking about trip number 2! It really is, it’s the perfect place to take a vacation from your trip. The Philippines in general is a pretty laid-back place though, so there was never much stress for us to escape from! So did we! Sometimes it feels as though you can’t lose in the Philippines, just pick an island and go and you’re sure to have a good time. As I’ve said, we already have a laundry list of other islands we intend to visit! I’m so pleased you’re enjoying the my home country (I live in NYC now) and enjoying what it offers best – the people! :) Glad to see Camguin through your eyes. I haven’t been there and I plan to go next time I visit home. Your photographs are beautiful. Happy travels.